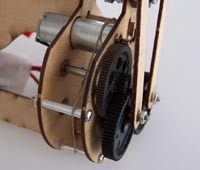 There are two ways to build an ornithopter gearbox. The simplest method is to space the gear axles along a linear rail or strut. This method is recommended for micro-sized ornithopters, which usually don't have ball bearings. The other method involves two or more plates with spacers between them. Bearings can be pressed into the plates to hold the gear axles. 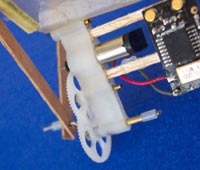 The plate gearbox design is better for dual-crank mechanisms and it lends itself to the more complex body designs typical of larger RC ornithopters. Spur gears as shown are the best choice for ornithopters because of their low friction. You should avoid using worm gears. They might be tempting because they permit substantial gear reduction in a single stage, but the frictional losses are extremely high! A chain drive might be considered for large or manned ornithopters. By distributing the load onto more of the gear teeth, the chain drive permits weight reduction, and it is nearly as efficient as spur gears. The limited supply of suitable gears long made it difficult to build electric-powered ornithopters. Recently, the plastic cluster-type spur gears from Didel have made it much easier to build gearboxes for ornithopter micro-air-vehicles. For larger ornithopters, gears are available from industrial suppliers like Stock Drive Products. Suitable cluster gears are not available in these larger sizes, and the pinion gears typically don't fit the same shaft sizes as the larger spur gears. The solution is to put the large spur gear on a shaft made of "pinion wire". This provides a simple, lightweight solution for achieving substantial reduction ratios. Depending on the total reduction ratio you need, your gearbox might have one, two, or three reduction stages. A single stage gearbox is the simplest to build, but it usually won't provide enough gear reduction. Multiple stages add to the complexity of the gearbox but allow you to achieve greater reduction ratios without using excessively large gears. It's easy to calculate the total gear ratio. It is simply the product of the individual stages. For example, if the first stage is 5 to 1 and the second stage is 6 to 1, then the total reduction will be 5 x 6 = 30 to 1. How much reduction is needed? That will depend on your motor selection and what flight characteristics you want the ornithopter to have. The "micro air vehicle" type ornithopters, in order to meet size requirements and handle wind better, have small, rapidly-beating wings, and a high wing loading. These ornithopters might have a gear ratio of 30:1 with a coreless motor. Larger RC ornithopters typically have a gear ratio of about 100:1 with a standard brushed motor, or about 35:1 with an outrunner. As described on the "motors" page, there is a need to fine-tune the gear ratio in order to optimize performance.